A Union army infantry soldier stands atop a 56 foot high granite shaft with four other figures around the base. The soldier holds a musket which rests on the ground in front of him. Other figures are an officer with sabre, flag bearer, cannoneer, foot soldier. Location: Just inside the cemetery on the west side of town. 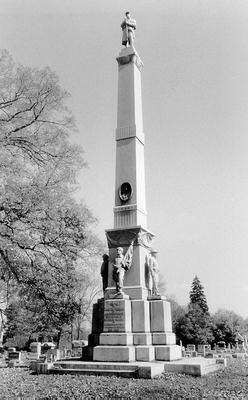 : James Brown King, “Greenfield Civil War Monument,” Ohio Outdoor Sculpture Inventory, accessed April 22, 2019, http://oosi.sculpturecenter.org/items/show/527. Just inside the cemetery on the west side of town.